So, what are people favs? The Back Country Roast Chicken is my favourite. I don't mind some of the other dinners that make but it's all freeze dried. I've tried to buy dehydrated foods from America but they're mostly cottage industries suppliers with small staff numbers and won't ship outside of the U.S. I always take some powered spud with me. Diner Deluxe Scrambled Eggs (which I turned into an omelette) get the thumbs up. Just add hot water to the packet, mix well, seal up & leave in a insulated pocket for 10-15mins. company located in the US...much faster too. Last edited by ofuros on Mon 29 Sep, 2014 5:19 pm, edited 1 time in total. I have recently tried some of the Packit Gourmet meals from the USA, one was way too salty for me but the others were excellent. Hey you beat me to it mate. The chicken and dumplings was my favorite so far. The Jamaican peanut porridge was pretty damn good as was the red beans and rice with smoked sausage. Last edited by ofuros on Mon 29 Sep, 2014 6:02 pm, edited 2 times in total. Stop it Simon .....your making me drooool ! Im getting fat reading this thread. Chefsway spaghetti bolognese and mushroom risotto. And Deb with onions. The most consistently good tasting dehydrated food I have yet tasted is Real Turmat out of Norway. Sadly, I haven't seen them for sale here. RonK wrote: Chefsway spaghetti bolognese and mushroom risotto. The Irish Stout Beef and Mash is pretty good, too. Sounds good - a new recipe that I haven't tried yet. RonK wrote: Chefsway spaghetti bolognese and mushroom risotto. And Deb with onions. I enjoyed the Chefsway mushroom risotto on a flinders trip. Found it a bit salty though. 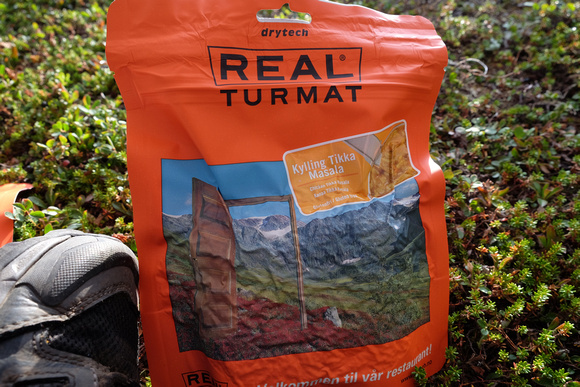 photohiker wrote: The most consistently good tasting dehydrated food I have yet tasted is Real Turmat out of Norway. I'm trying to organise some time in Tromso next year, if it happens I'll be happy to send some your way. Thanks! I've got a stash from my last trip, be gone by then. I had zero problems bringing them through customs, I wonder if they would get held up if shipped in. What trip are you doing out of Tromsø ? +1 for Pack it Gourmet meals and also the makings in their general grocery store for those that like to make their own. I also like the most of the Backpackers Pantry chicken meals and their Cuban Coconut Black Beans and Rice. Also the Chicken Fajita Filling Wrap from Mountain House is very good eating it by itself or in wraps. Backpackers Pantry and Mountain house I get from Campsaver in the states, and they are still pretty cheap but getting dearer for every drop in the exchange rate. But free postage for purchases over $400us to Australia. suit your taste buds....a few more options below to explore. http://www.drytech.no/index.php/en/ .....photohiker & icefest's choice. Last edited by ofuros on Fri 24 Oct, 2014 9:17 am, edited 1 time in total. photohiker wrote: Thanks! I've got a stash from my last trip, be gone by then. I had zero problems bringing them through customs, I wonder if they would get held up if shipped in. They do get delayed through customs...only a day or two though. These caught my eye in my local Anaconda this morning....outdoorgourmet & Backcountrycuisine. I havn't tried them yet but at least they're made locally, Oz & Nz. http://backcountrycuisine.co.nz/ ....their website is a bit glitchy at the moment. creamy, buttery tasting potato. I'd buy this one again. Both companies have a second tear line half way down the packet, which is a great idea. No need for those long annoying spoons...I used to cut off the top half of the packet anyway. Last edited by ofuros on Thu 30 Oct, 2014 5:23 pm, edited 11 times in total. ofuros wrote: These caught my eye in my local Anaconda this morning....outdoorgourmet & Backcountrycuisine. Thoroughly recommend these... much much better than Backcountry IMO. The Coq Au Vin is the nicest commercial dehydrated meal I've had. Backcountry are OK (beef hot pot and mex chicken my favorites) and easy to come by but will get the Outdoor Gourmet if I can. Didn't know Anaconda had them, good to know. I remember this. Can't remember the brand but they were basically repackaged Army patrol rations ('E' pack from memory ). I recall when you opened the package (was predominantly white?) there was a dark green foil pack inside. I also remember that the Chicken Tet was far and above the rest of their range(there was a tuna mornay, a something-or-other teryaki and a few others... awful the lot of them). Haven't seen them for years though. They were made in Scottsdale Tas as Army rations and still are, initially sold to the public in their green foil bags with a clear Zip Loc outer , an Outdoors Supplier (or someone like that) decided to take on the Retailing this product (Adventure Foods or something like that) with a subsequent increase in price and a short stint in the Marketplace thereafter,their Spag Bol was nice also . If you feel like a Dehydrated or Freeze dried change, Expiditionfoods are available a bit closer to home(Hong Kong). freeze dried meals, stick it in your beany for around 15mins. Used their service a couple of times now, it's fast & reliable. Of course just as easy to make your own or just use their menu list for ideas. Just don't order the meals with whole corn kernels in them....they will get seized. I tried to order from Packit Gourmet the other day. $85usd worth of food and $65usd freight to oz. I went back and ordered more food thinking freight may come down but it went up too. Is there a magic qty or how did you get it into Aus without paying massive freight? I use a mail forwarding company, and combine it with other orders. that plus free domestic US shipping...and a good strong exchange rate (which we don't have at the moment) makes all the difference. from the West Coast of the USA to Brisbane, while the other companies go via Hawaii then Sydney. As Simon says...combining packages works out cheaper too. Not cheap, but your paying for convenience & speed of delivery to your door. Hope that helps....I'm always open to cheaper shipping ideas though. I've just ordered from Strive Foods in Tasmania so I'll try theirs first.